Trailer Park is Electric Picnic's strange new world, a camp of hilarious caravans, utilitarian mobile homes that have undergone surgery, vans re-functioned, campers converted. Collectively they create a metropolis of tiny venues, interactive cultural outposts, fun-clinics and oddball theatres. For the past two years over thirty creators have been given grants to help them realise their wildest ideas, and become part of one of the strangest design communities in the country. We are pleased to announce that the 2016 search is underway, and this might just be the creative circus that you always wanted to run away with! We are looking for more jaw-dropping and bewildering caravan-based ideas to join Trailer Park - we seek fresh designers, artists, engineers, technicians, builders, architects, and dreamers and ask them to emerge from their cerebral laboratories with some preposterous festival inventions! The judges for this year will be led by Keith Payne whose enormous inflatable sculptures for the stage-sets of The Rolling Stones and Pink Floyd are renowned worldwide will be working with the Trailer Park creative team; Roz Jellett, Charles Preston, Hugo Jellett and Sorcha O’Reilly. 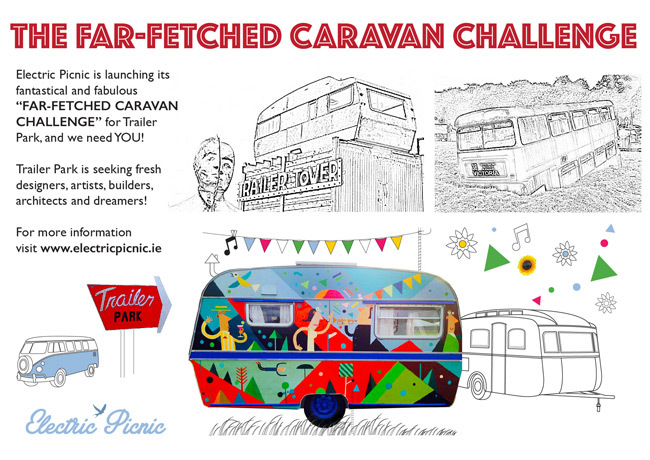 We will offer up to ten cash grants to help you make your own caravan projects come to life at Electric Picnic, ranging from €150 to €1,500. We'll consider one larger grant, if an exceptional idea is proposed. These bursaries are not for your labour; they are for materials or skills you do not have. We are looking for projects that stand on their own as installations, independent of performances or activities, although these may well accompany and complete the installation. They do not need to be roadworthy, but it would definitely help if they were. They do need to be safe. The key word to consider is that these caravans need to be INTERACTIVE. They need to be about the design of the exterior as well as the interior, and applicants should think about lighting as the area operates at night-time as well as daytime. Please note that this project will require a significant time investment, and the ability to adhere to firm deadlines, and is going to need to be fuelled by artistic and practical passion.